Feature:Only romance, no dangerous flames, no fumes, no wax mess. If you're looking for battery operated candles, you might be surprised to hear that there's a huge difference in quality among the various brands. All lights are NOT created equal. These flameless candles are OMGAI, and the OMGAI brand glows with True Flicker lights-which are simply the best and most authentic faux flame available on the market. Save Time, Save Money and Enjoy Life More With Mars Flameless Tea lights, Buy a Box For You And Your Best friend! ★ FREE DECORATIVE FAUX ROSE PETALS - Every buyer of the Tealight Wavy Candles gets some premium quality of decorative faux rose petals as a bonus from the Storefront.These rose petals can be scattered around these tea lights to enhance the beauty.Add rose oil on few petals and the romantic setting is good to go.The rose petals are just icing on the cake, a deal on top of a deal! 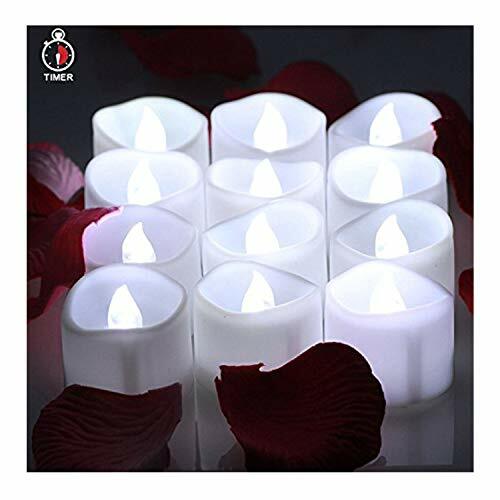 ★ EXTREMELY BUDGETARY,EASY AND HASSLE - FREE - Each Box contains 12 Flameless Tealights.They are an absolute beauty, they are easy to operate, safe and hazard free for any setting and they can be turned on with just a button at the bottom.Not only that, but The OMGAI Store offers them with the CR2032 batteries already included in each and every Tealight Candle.Best in Class.